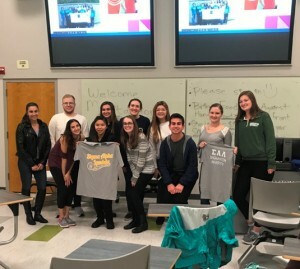 After going over topics such as chapter updates at their recent meeting, SAL’s Binghamton chapter was treated to an insightful presentation from the Binghamton Meditation Club. The meeting was well attended, with 30 members between the two clubs present. In addition to the presentation, chapter members had the opportunity to take part in a meditation session led by the Meditation Club. “All members were able to actively participate in the mediation component, which was a unique event for our chapter,” said Chapter President Caitlin Healy. For more information on the Binghamton University chapter, click here.